Kimberly Franklin: I'm an Award Hoarder! So in an attempt to catch up, I'm going to thank a few people for the lovely awards given to me and give out one in return. Phew... I have a feeling I've got my work cut out for me. First off, I want to thank some of my fellow blog buddies for a few awards that were so graciously given to me. 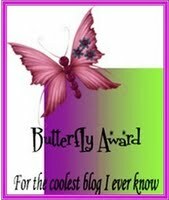 <<<<==== I owe thanks to Jennifer and Christa for this lovely award. Isn't it pretty??? <<<<====== Also, thanks to Maha. 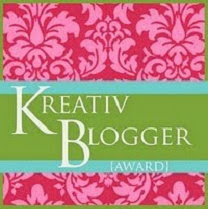 I received this beautiful Kreativ Blogger Award. It's official... I'm Creative! YAY!! I love this award. 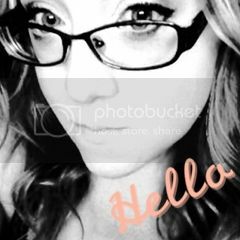 It is so fun and I have many bloggy buddies to thank for this one: Tiffany, Jen, Melissa and Merissa. All of these ladies are fabulous, so be sure to check them out! 1) I once worked with my best friend in a BIG PURPLE ice cream truck. (Sounds snazy, right?) We sold snow cones. We never had any customers, because, you know we were just too cool for customers, so we spent all of our time:having snow ball fights and watching for hot boys to pass by. Fun times! 3) By day I was a high school junior, and by night I worked as a DJ. I never got tired of going to all of those cool college parties--that's where all the HOT boys were! 4) I once knocked my driver's side mirror off of my car and "pretended" to not know what happened when my parent's noticed. "Must have happened in the school parking lot," I said, innocently. Ha-ha, jokes on them. I totally did it! ;) Shh... don't tell!! So... which one do you think is a lie?? It's hard to tell, right!? Muahahaha... I might have done that on purpose! But I'll never tell!! I'm curious to see your choices--very, very curious!! I can't wait to hear her lies! She is hilarious and I think she will do a fab job! Before I go, I want to thank everyone who awarded me all of these lovely awards, again! 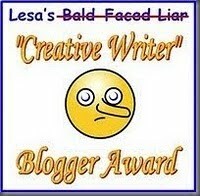 These blog awards always make me SMILE!! Also, don't forget to check all of these bloggers out! And you can also visit my Awards page for a full listing of my awards and the lovely (probably crazy) blog buddies who gave them to me. I'll reveal my truth next week, when I give away ONE MORE AWARD! YAY! I hope you all have a great day, and I'll be back on Friday! You should have a great Wednesday!! Happy Award Day!!! Amy rocks!! Is number one the lie???? Congrats to all your well deserved awards! Oh noes! I'm an award hogger as well. But i'll get on the lies today. By the way, I think your mirror story was the lie because there were no hot guys in there. Wow, a whole latte awards going on here! A big congrats to you! I'm torn between #1 and #3 as the lie, and think I'll go with #3. Congrats, I went to check out the links and followed them all. Wow. Look at all the pretty. :) Congrats on all the awards. Congrats on all your nifty awards, Kim. :D I admit I'm awful with remembering to post awards. I've gotten some within the past few months but now I can't remember and feel bad for looking like I'm ignoring people's generosity. My life is too crazy atm I guess. XD At least you get around to it at some point. Congrats on all the awards!!! I'm voting #4 is the truth...I'm right, aren't I? Tell me I'm right...I'm so impatient! I don't know how I posted three of the same things- going to delete two of them now. Although, it always looks ominous to see a "removed post" message, doesn't it? Congrats on all the awards! Yay! I'm going to go with Number 4. Can't wait to find out which one is true! I'm going to say Number 2 because I can totally see you doing that. But I think the DJ thing would have been awesome!hahah Speaking as a friend...not as a parent. I'm going to guess number 3. I have no clue if I'm correct, though. Congrats on all the awards! I think #4 is the truth - that totally sounds like something I would do. Well it looks like I am not the only one who thinks you are awesome! Congrats on all the awards! YOu're so cute, being an award hoarder! Congrats on all the awards! Woot! And I'm going to guess that number 3 is a lie just because the others have a lot more detail! Maybe? I kinda hope number 4 is true because that totally happened to me (I broke my mirror off by hitting a mailbox but told my parents it was like that when I came out of the supermarket! LOL!). Tell me I'm not the only one! Congrats on all the awards! I saw the answers before the question, so I can't guess now. 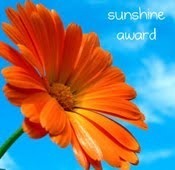 I love that Sunshine Award, by the way. It reminds me of Maria De Los Santos' "Belong To Me" cover.